We landed in Managua, the capital city of Nicaragua that has a population 1,146,000 ; pretty impressive since the entire population of Nicaragua is only 5,891,199 (based on 2009 statistics). We're just waiting for our fearless leader and tour guide - Joan of Foodalogue .The land area of the country is 46,430 sq mi and if you've followed the tour thus far and compare it to San Salvador, Nicaragua has a much larger land surface. It is, in fact, the largest of the central American countries and the most sparsely populated. Nicaragua borders Honduras to the north and Costa Rica to the south. It is slightly larger than New York State. Nicaragua is mountainous in the west, with fertile valleys. 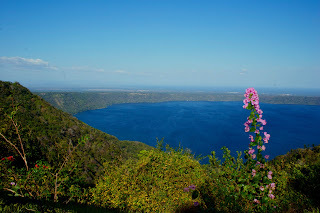 Two big lakes, Nicaragua and Managua, are connected by the Tipitapa River. "La comida Nica," as Nicaraguans call their cuisine, is a Latin creole mix of indigenous and Spanish dishes and ingredients. Corn, beans, plantains, yucca and pork are popular ingredients. Seafood is common along the Caribbean coast. 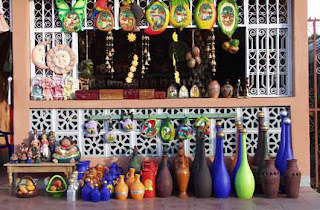 Nicaraguans make extensive use of a wide variety of tropical fruits. Typical dishes include nacatamales, vigorón, indio viejo and gallo pinto. We've arrived in time for breakfast and I'm so hungry. What does one eat for breakfast in Nicaragua? 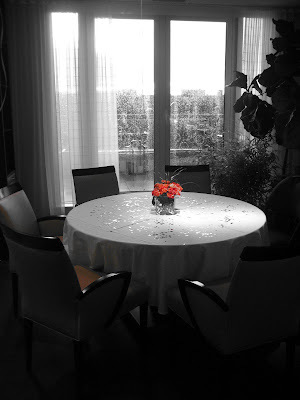 Well, Casamiento of course!!! This hearty, healthy and filling dish is your basic rice and beans. 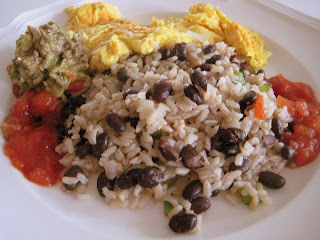 The beans in this case are black (you can easily use red pinto beans), and the colour of the beans on the rice gives casamiento its name. Especially popular is serving the casiamento with scrambled eggs for breakfast. Heat the oil in a large skillet or sauté pan over medium-high flame. Add the onions, bell pepper and garlic and sauté for about 2-3 minutes, or until cooked through. Have you heard or are familiar with the term "probiotics". When I ask people what they think probiotics are the usual answer is "I'm not entirely sure but I know it's good for you". Ok, so at least part of the message gets through. Although not an end all and be all we're all well advised to at least research the benefits of probiotics and if they will work for us. 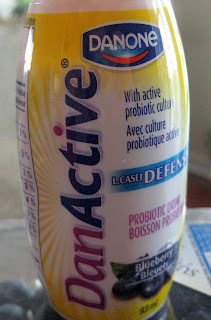 That's why, when contacted by BzzAgent to do a report on Danone DanActive Drink, it fed right into my interest in learning more about probiotics and how they work with a balanced diet and healthy lifestyle. I did receive a coupon to try the product with several more to give away for others to try. According to the literature from Danone, DanActive contains 10 billion L. case/Defensis friendly bacteria in each bottle, a culture created and used exclusively by Danone which helps maintain your natural defenses. I'm not entirely sure what that means and/or how to measure that in terms of effectiveness. Danone Group is an international company and you'll see their products on your grocery store shelves in most countries using the same name. The product comes in 4, 8 and 12 pack 99 ml containers. I did two things - firstly I drank one bottle straight up. It reminded me of liquid yogurt with a bit of a tang to the taste. What I liked about the bottle is that it's small enough to fit into my purse and if I'm out having an active day it's an easy tag along. 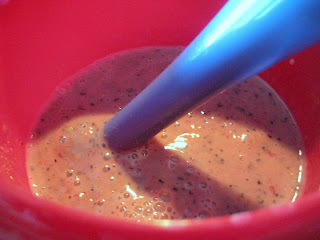 Then I decided to use it with my morning smoothie. 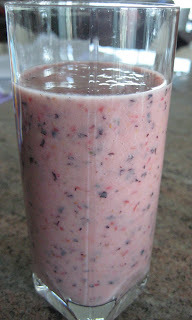 My fruit combination was banana, strawberry, blueberry (same flavour as the DanActive drink) and papaya. The 4 pack sells in the stores in a range from $2.88 - $3.99 and comes in a variety of flavours. Have you tried it? I don't consider myself to be a lucky person. I mean, specifically, as it relates to winning money, having my name drawn for a prize, etc. Admittedly, I'm not much of a gambler, which cuts down winning opportunities. Research suggests that the belief that you are lucky actually has an impact on more objective measures of luck (e.g., how often you actually win things). Here - watch this video for an elaboration on the idea (it's lengthy, but interesting). Maybe my luck is turning around... A couple of weeks ago, I won free movie tickets from Girl About O-Town. A couple of weeks ago, she posted a contest to win free passes to see Creation, a movie about Darwin and the process he went through when writing The Origin of Species. R and I went. Now - I have to tell you that during about 85% of movies, R will (at some point) lean over to tell me that the movie is crap. I suppose it's a step above his reactions to tv shows I watch -- where he will break into fake dramatic tears. Thankfully, he held back and only told me the movie sucked once. I suspect the book would have been better than the movie (haven't read it though). There was some interesting imagery and the performances were good. But, I felt that the plot dragged. I also couldn't help but be distracted by the parallels between this movie and previous movies that Paul Bettany and Jennifer Connelley had been in. The basic plot -- brilliant scientist with poor social skills slowly degenerates while experiencing hallucinations. Kind of like A Beautiful Mind. Then you have the other plot about the scientist theorizing and conveying messages that would oppose the Catholic church. In this movie, the opposing theory is evolution, in The Da Vinci Code, it's revealing the truth about stories in the bible. But, I'm happy to have had the opportunity to go see the movie! Definitely check out Girl About O-Town. She's a fellow Ottawa blogger who is starting an exciting time in her life. I know I should enjoy a vegetarian quiche, but there's something about spicy sausage that takes quiche from a lunch dish to full meal. Cook in oven (around 350 -- I turned mine up to 375 because my oven is slow) until it becomes golden and is cooked through (about 45 minutes). Feel like reading a short story? For your gift. I would like to offer you one of 3 gifts and you choose the one you like. 1. Vacation to Toronto during [theatre festival Actorboy is involved with], including free passes to all shows and accommodation, downtown. 2. $200 worth of new music for your listening pleasure. All newly bought, guaranteed for you to love. 3. I would create and make a 5 minute film with you, casting professional actors and a professional dio.p (camera operator) and film editor. You will direct the movie. I will help. We chose option 2 because the timing on the first one didn't work for us and the third one just sounded like something that would result in Actorboy and I killing each other (we don't always see eye to eye). Guess which one they chose! Option 3. R is not impressed. Wait until he finds out that he has to wear a kilt for it too. R is just hoping that they're forget about the gift all together. 1. Cranberry White Chocolate Oatmeal Cookies from Katie at Good Things Catered...Except I used milk chocolate chips rather than white chocolate. 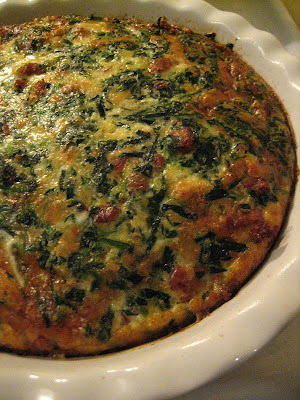 Highly recommend you try this recipe -- so good! 2. Giz's Bran Muffins -- also very good. 3. Biscotti -- Giz bought these at her favourite Italian store. 4. Peaking through are Shortbread Cookies made in the processor. 6. Butter Tarts -- also very good! 7 & 8. Rugalech - Ugh - how did I manage to number two of the same item?!? 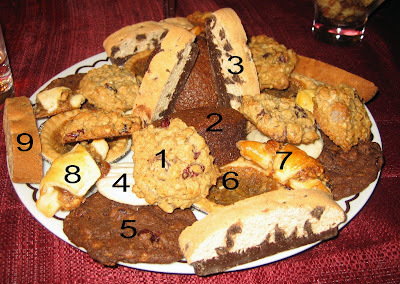 Also included were Kourabiedes (Cocaine Cookies) and some Snickerdoodles that didn't work out so well (accidental doubling of butter). Also featured on the table were some cute seasonal napkins that I got from Loblaws. 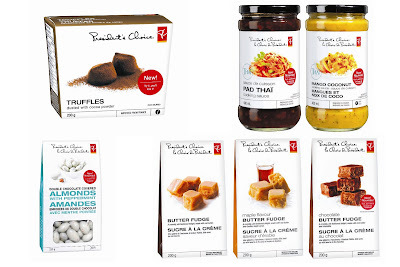 As a member of View and Review (a group within BloggerAid:Changing the Face of Famine), I received a box filled with these goodies from Loblaws. R kept the truffles as his special treat. Thankfully, they're very rich -- so there was never any temptation to have more than one at a time. I brought in the maple butter fudge to work. Although I'm not a huge fan of fudge, they were well received by my colleagues. It was a bit confusing, though, to see that the maple syrup came from Quebec but that the product was made in England. All I have left over is the Pad Thai sauce. It looks enticing, but I'm a bit weary about the salt content -- 610 mg in 4 tbsp. Check out Val from More Than Burnt Toast's delicious-looking dish, made with the pad thai sauce. Funnily enough, I just came home from my weekly trip to Loblaws. Now that we've moved, I shop there regularly. I'm really hoping to see them expand their line of eco-friendly household items to all of their stores (not just the mega stores). El Salvador is a very small country nestled between Guatemala and Honduras; only 8 square miles with a population of just over 7,000,000. That would make the whole country about 1/3 larger than the city of Toronto. Although small, the country has a rich history that dates back to the Aztecs. 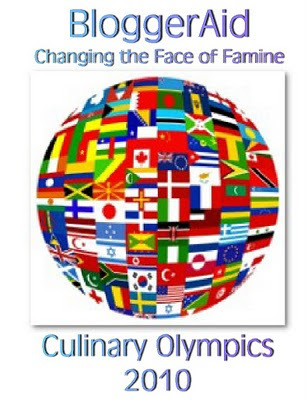 The cuisine seems basic and not unlike many of the central American countries. 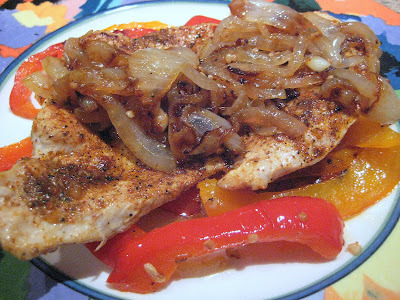 I found this recipe for chicken smothered with carmelized onions - quick to prepare, and both wholesome and satisfying to eat. 1. 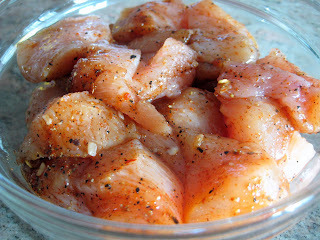 Season the chicken pieces with salt and pepper. Heat the oil in a large sauté pan or pot over medium-high flame. Working in batches, brown the chicken pieces in the hot oil and remove to a plate. 2. Pour off all but 2-3 tablespoons of oil and add the onions to the same pan. Reduce heat to medium-low and sauté until cooked down and just beginning to brown, 10-15 minutes. 3. Increase heat to medium-high and return the chicken pieces to the pot. Add the water or stock, wine, bay leaf, salt and pepper and bring to a boil. Reduce heat to low and simmer, covered, for 25-35 minutes, or until the chicken is cooked through and tender. 4. Adjust seasoning and serve with rice. Note: I used chicken breasts instead of pieces and just adjusted cooking times. 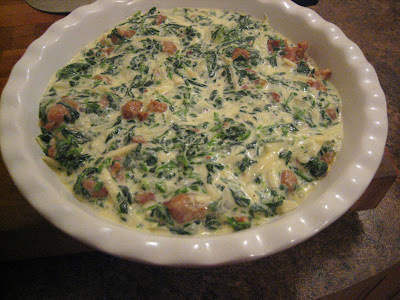 The onion is the hero in this dish and brings alot of flavour to what could be a bland dish. After years of anticipation Canada will be hosting the 2010 Winter Olympic Games in Vancouver, British Columbia from February 12th – 28th. Canadians across the country are not only sharing in the pride of being the host country but looking forward to seeing all of your countries around the world participating in winter sports. We'll all be cheering on our athletes who have trained so vigorously and are set to represent their respective countries. Buenes dias and welcome to Mexico. You've reached the first stop of the Equal Opportunity virtual trip with Joan of Foodalogue . 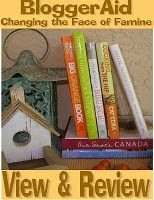 If you didn't participate in Joan's last virtual culinary tour, your timing is good for the new tour by starting now. 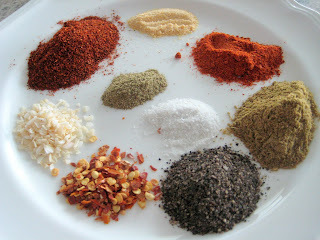 To ease into the cuisine I thought I'd start with a recipe that I found on All Recipes for Taco Seasoning. Shame on me for knowing absolutely nothing about cuisine from south of the border. 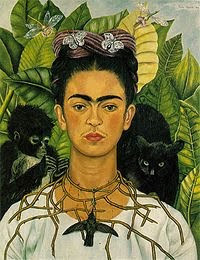 I do know that one of the Mexican painters I admire is none other than Frida Kahlo. Gotta love the unibrow. What better way to start than from the ground up - understanding the ingredients. * I changed the onion powder for onion flakes and decreased the amount of sea salt. Very flavourful and lets you monitor the ingredients to you preference - perfect. I think not knowing much about a cuisine isn't such a bad thing. You don't have to follow any "rules" and your creativity can just take over. 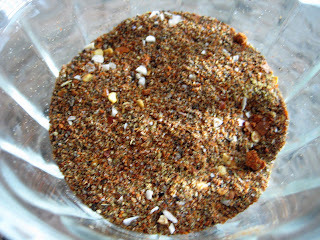 I mentioned to an acquaintance who is from Mexico that I made taco seasoning and was going to use it with chicken. She actually looked horrified. "Noooo...she said, taco seasoning is for beef". I listened and then thought it's okay to break the rules. 1. Heat olive oil in frying pan to medium heat. 3. 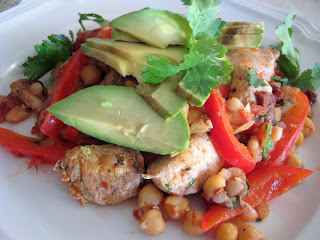 Add chicken pieces and fry until chicken changes colour on both sides; mix in beans, diced tomatoes and chipotle pepper. Cook together until combined (about 5-10 minutes) and the chicken is cooked through. 4. Finish with lime juice and cilantro. Verdict: A really delightful combination where each ingredient comes through and packs a bit of a punch too. I made this recipe up using simple intuition and a vision of what Mexican food might taste like. I love it, or at least my version of it. 1. 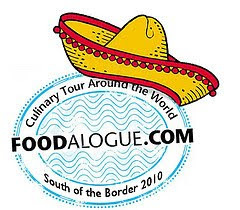 Grab the event logo and put it on your blog with a link to FOODalogue. 2. Let Joan know by email (info@foodalogue.com) when you’ve published. 3. Send her the original (large) photo link/file. It will be re-sized for best resolution. Joan will publish on January 11 and every Monday thereafter. You can publish on (or about) the same time. Two days later on January 13 and each Weds. 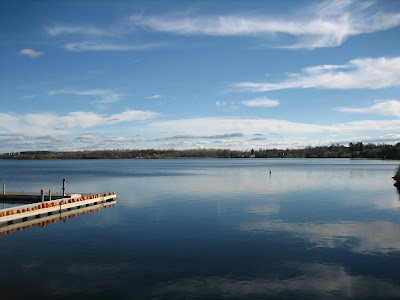 thereafter, a photographic round-up featuring all participant blogs will be published. 2009 was a good year at Equal Opportunity Kitchen. We've had much to celebrate - We've experimented with many new foods with varying degrees of success, made alot of new blogging friends and happily were part of creating and publishing The BloggerAid Cook Book I'd say that's a good year. Thank you to all of you for visiting, commenting and sharing some food and fun with us. Now... it's a new year and all indications are that it going to be great. Here we are, early January and going into our 4th year of blogging; where does the time go. After the ultimate of gluttony during the holiday I'm feeling the need to detox for a while. On to today's recipe. 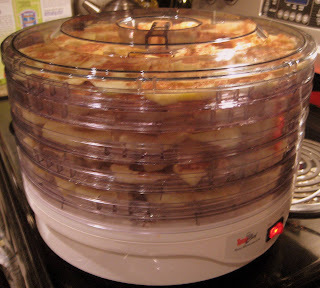 Psychgrad bought me a dehydrator a few years ago. As many of you already know, I spent 5 1/2 years on dialysis for kidney failure. During those years fluid restriction was a must and all intake had to be monitored. 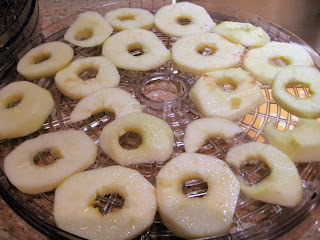 This dehydrator was an extremely thoughtful gift as it allowed me to enjoy fruit without the addition of liquid. 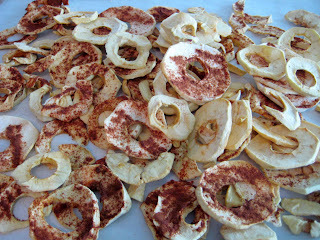 I pulled it out today and decided to make use of it by making some healthy apple snacks. The recipe is so simple that there really isn't much of a recipe. 10 apples (mixed macintosh, delicious and cortland apples). I enjoyed the combination because each has a varying degree of moisture and the end product gives you slightly different textures. Peel and core apples with a corer. Slice into 1/4 inch rings. 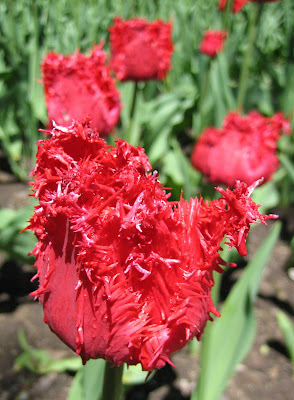 Dip into a pretreatment mix - this can be pineapple or lemon juice. 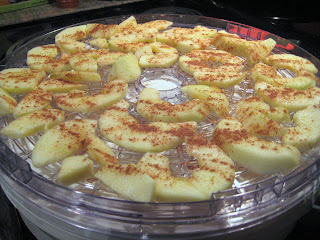 Remove the apples promptly (about 2 minutes) and place in trays. 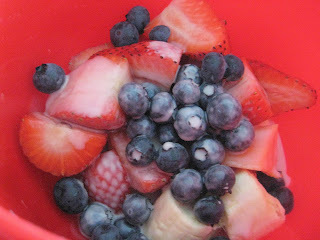 You could also use Sodium Bisulfite to pretreat the fruit but I prefer to go the natural way. 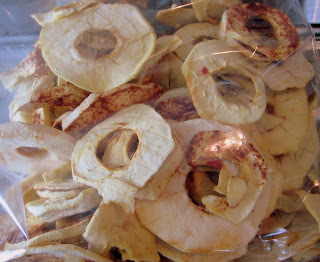 Before you know it you have a full 6 shelves of apples happily dehydrating. The length of time for dehydrating varies on your dehydrator, the thickness of the fruit and type of fruit. For apples the spread can be as little as 4 hours or as long as 14 hours. 3. 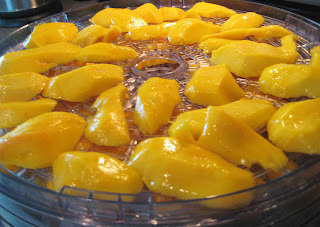 If you want to pasteurize the fruit, spread on a cookie sheet after dehydrating and bake in the oven for 15 minutes at 175 F.
4. Use only good quality fruit. You can also try your hand at favourites such as pineapple or mango. 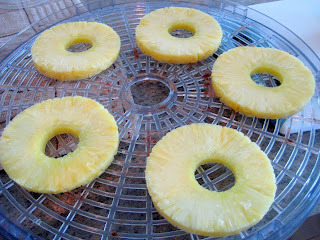 Pineapple dehydrates for about 10 hours. I put the mango shelves on the top since they're quicker to dehydrate. Fruits are only one option for dehydrating. Beef jerky is a favourite as are dehydrating herbs when they're in season. I'm still using dehydrated herbs from the summer (I store them in the freezer). I have it on good authority that dogs love dehydrated liver. The only caution would be that your house will smell like liver for days. You could always plug your dehydrator outdoors but don't be surprised if there's a lineup of neighbourhood canines holding doggie bags :). I'm really tempted to put together a New Years post. 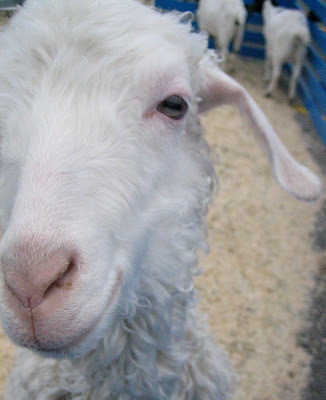 I was considering doing "a year in review" or a "top 10 recipes of 2009" kind of post. But, I've been more interested in thinking about the future. So much has changed in the past year that I feel like it's time to take a step back and assess the new trajectory. Becoming more settled over the past year has made R and I eager to travel. 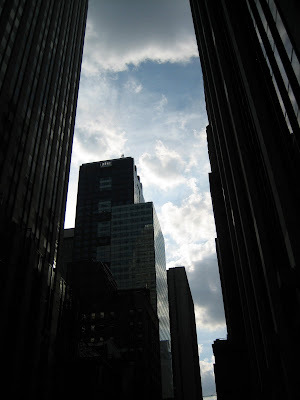 We really enjoyed spending time in New York (and hope to go back). This year we'd like to travel further and for a longer period of time. This year, I hope to learn a lot about home remodelling -- ideally not "the hard way". I am not particularly skilled with handywork, but I'd like to learn how to do some things like tiling a backsplash or laying laminate flooring. I'd like to grow a garden...Successfully. I'd like to return to volunteering -- almost weekly I look at the flyers advertising volunteer positions. I keep waiting until I feel like I have things crossed off of my list. Realistically, the list is eternal - so it's time to just do it. I'd like to host more dinners and get-togethers. Sure, it's bloody cold outside - but we can't stop living! 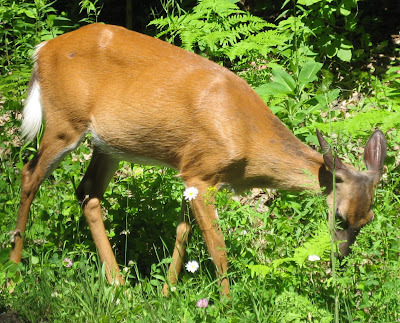 I'd like to simplify my life, spend more time in nature and focus on the positive. I've been told by a few too many people that I'm a pessimist. I don't fully agree, but I will admit to having greater ease with communicating criticism than compliment. I don't intend on becoming a zen-master from here on out. But, I will commit to making a concerted effort to achieve these goals. I have some hoarding tendencies. Giz likes to make fun of me for it. When I go somewhere and buy something that is native to that location (or a rarity), I don't want to use it. For me, there is more enjoyment in keeping items to know that I have them (and the memory associated with them) than there is in using up the item. For example, when determining whether it's time to stock up on wine, I don't even consider the bottles I've collected from Turkey, France or Salt Spring Island. R and I told ourselves that we would drink the bottle of Champagne we bought in Reims (a city in the Champagne region) for a special occasion... but after a year of special occasions (graduations, weddings, buying a home, new years, etc. ), no one occasion seemed to merit opening the bottle. So, logically, I would have to deduce that I don't really want to open the bottle. I had the same feeling about the Tahitian vanilla beans I got from Julia. In her letter, accompanying the vanilla beans, I believe she wrote, "Can't wait to see what you make with these!" But, I knew I really didn't want to use them. After I use them, I won't have them anymore and then I won't be able to admire them anymore (yes, I occasionally take them out of the freezer just to look at them). Being that it has been almost a year since I received the beans, I thought it was time to actually put them to use. 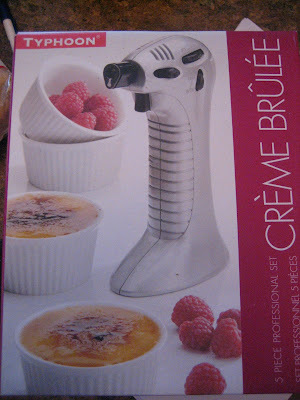 Plus, I received this crème brûlée set as a wedding gift. So - it turns out that I'm kind of a moron. 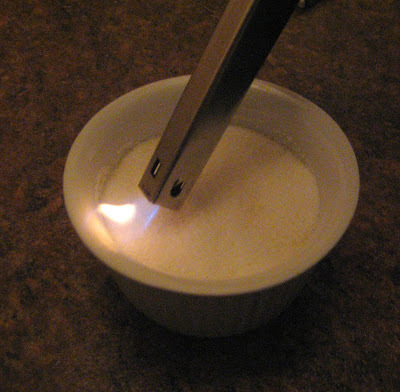 I didn't know that the set wouldn't come with the fuel/butane needed to work the torch. My friends and I momentarily tried to use a bbq-starter. So - we went with the broiling option. 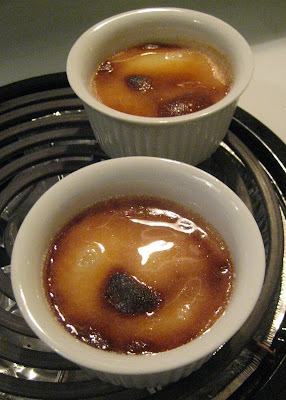 I'm going to need to continue perfecting crème brûlée. The recipe said to not overcook, but I'm pretty sure it needed more time in the oven. I'm still getting used to the oven in this house, which is probably about 25-30% slower than my previous oven. The flavours were really good, but the custard was not thick enough. The next day, I tried to cook the remaining portions to give them more time in the oven. 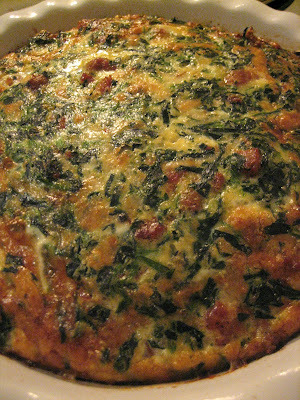 Even with an extra 15 minutes in the oven, it still lacked perfect texture. So the sporadic mission will continue. 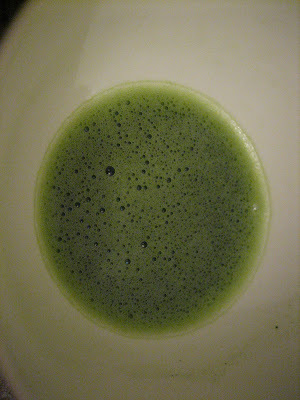 While trying to figure out what to do with the crème brûlée, I had my first exposure to the Japanese green tea, matcha. 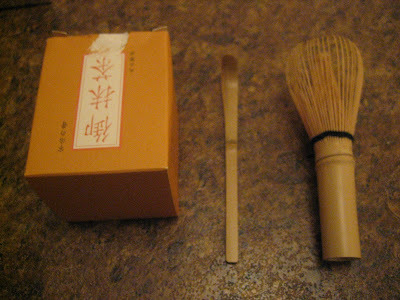 My friend recently spent some time in Japan and brought me some of the tea along with the traditional bamboo whisk used to stir the tea. To me it tasted like something you would put in a smoothy for its auto-immune benefits -- apparently it's an acquired taste. Note to self: don't drink matcha after 12pm. I had a couple of ounces at 5pm and was up until 4:30am. Then again, I don't handle caffeine very well. I think I'm going to give in a try in the morning -- maybe it'll give more energy at work.